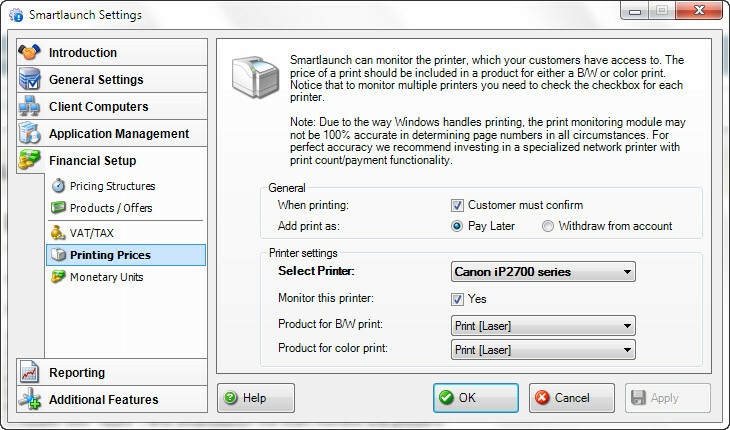 Smartlaunch easily allows you setup print monitoring so you can charge customers for every print transaction directly from Smarltaunch. Now you can repeat step 3-5 again for the 2nd (or more) printer you would like to monitor. Finally click “Apply”, and Smartlaunch will start monitor the printers. Note: It may appear as if SL only monitors one printer, (the one which is selected in the drop down), but it does in fact monitor all printers where you have checked the checkbox “Monitor this printer”. You can verify this by selecting the 2nd printer in the dropdown, and see that the checkbox is still checked for this printer.